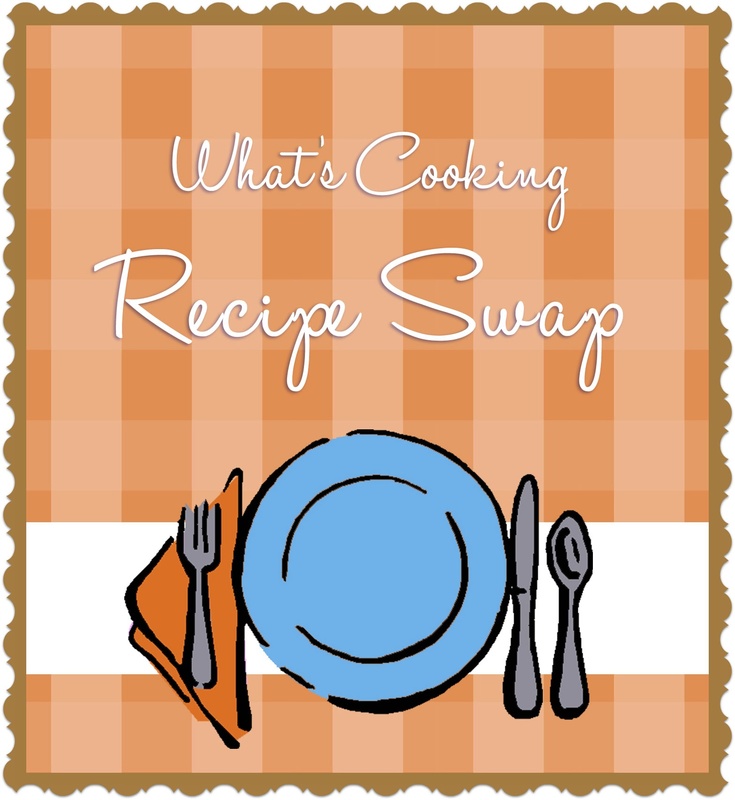 This week’s edition of recipe swap, hosted by Sarah at Taste of Home Cooking, was Mexican. 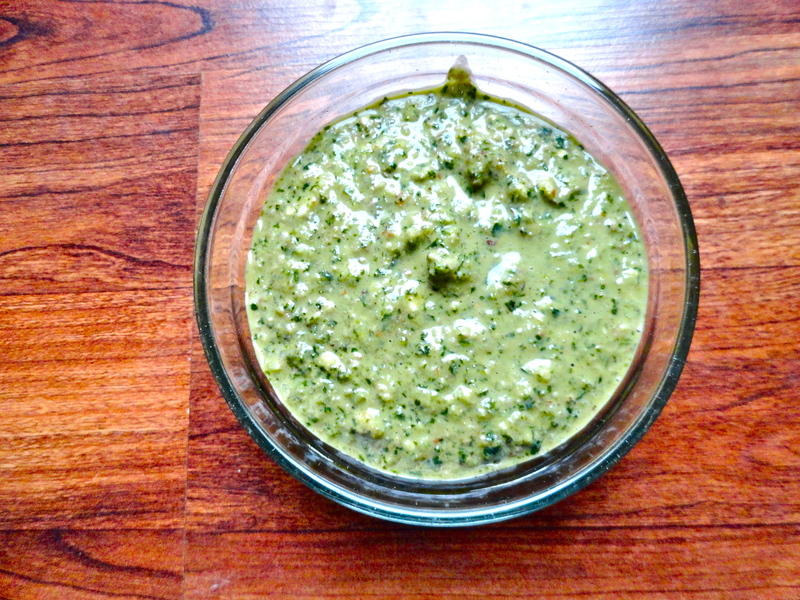 I was assigned creamy citrus jalapeno cilantro pesto from Jey at The Jey of Cooking. 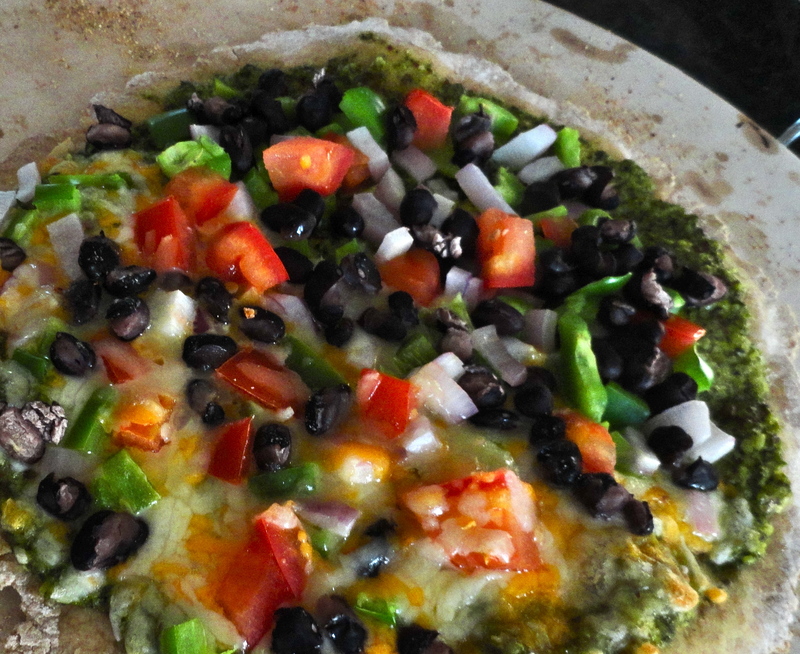 I love pesto and I love cilantro and jalapenos, so I was looking forward to making this. The ingredients were somewhat similar to the cilantro pesto I recently made from Thug Kitchen, but with the addition of citrus, which was appealing. I had to change a few things from Jey’s original recipe, but not much. Her recipe calls for pistachios, which I love, but Nate is allergic. So instead, I used almonds. I also had to add additional cilantro because my pesto was very watery. I used the juice of one orange and 1/2 grapefruit, but maybe my fruit was really big or extra juicy, because I couldn’t get the pesto to thicken up as pictured on Jey’s post. 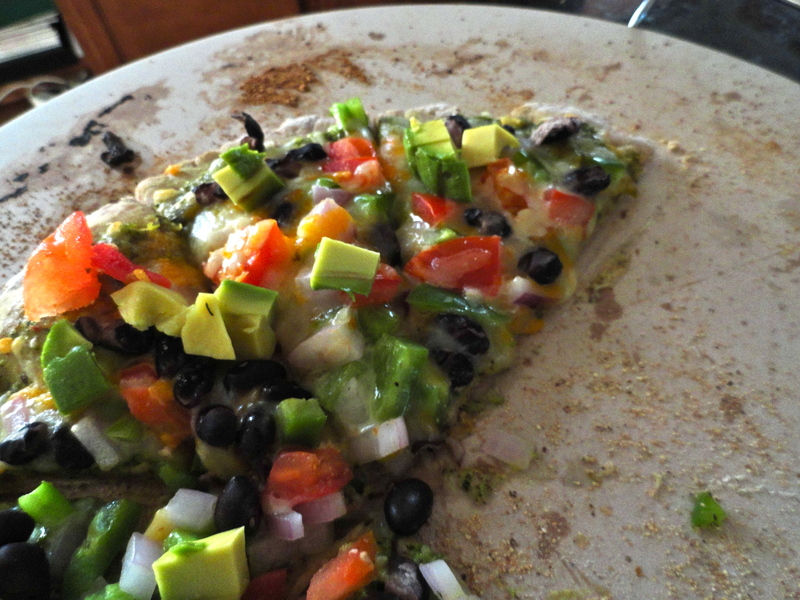 I added almost no oil because it was already so runny. I should have added the juice a little at a time, but now I know for next time. Jey recommended serving this over chicken or tossing with pasta. Seeing as though I’m really getting down to the wire for my 30 Before 30 list, I thought I’d take a risk and try it with tuna and check another item off. All the flavors go really well together, so while it was a risk, it wasn’t by any means epic. I marinated the tuna steaks in the pesto for about 30 minutes – I didn’t want to do it too long so as to start to cook the tuna with the acid in the pesto. 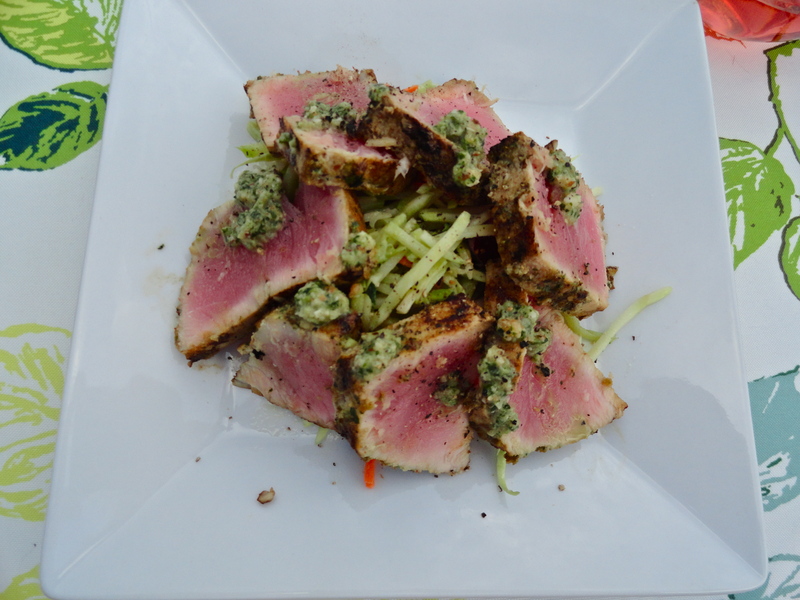 After quickly searing the tuna, I sliced and served it over a wasabi vinaigrette slaw and drizzled additional pesto over the tuna. 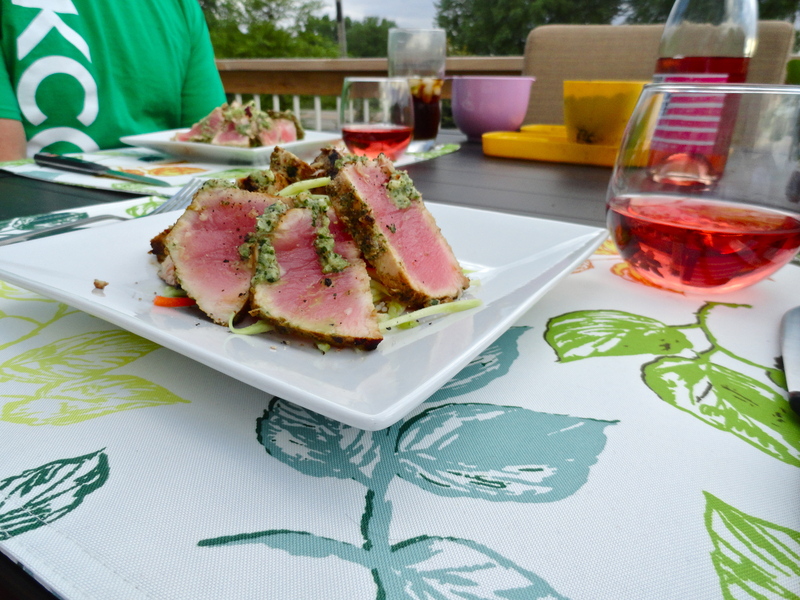 Not only was the tuna cooked to perfection (we like it rare, but feel free to cook it further if you like), but the pesto added the perfect amount of flavor, without over taking the clean taste of the tuna. The crusted pesto added the perfect amount of crisp to the outside of the tuna, while the drizzled pesto added it a little more freshness. 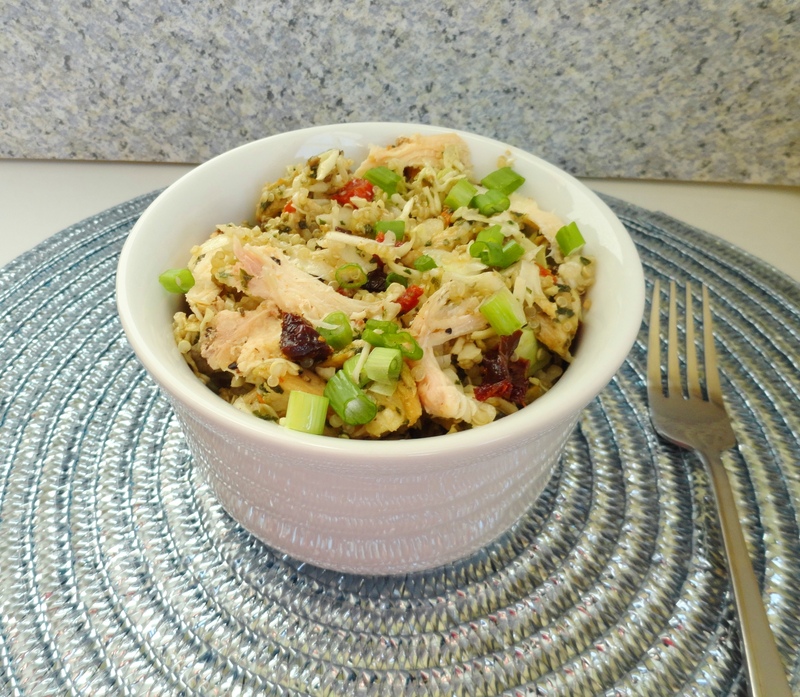 Nate and I both quickly cleaned our plates and adored this recipe! 1. To prepare the cilantro pesto, combine walnuts, almonds, cilantro, onion, jalapeno and garlic in a food processor. Pulse a few times, until ingredients are well combined. Add juices a little at a time – you might not need all of it – until pesto comes together and has thick consistency. With processor on, drizzle in olive oil until pesto has reach desired consistency. Season with salt and pepper to taste. 2. 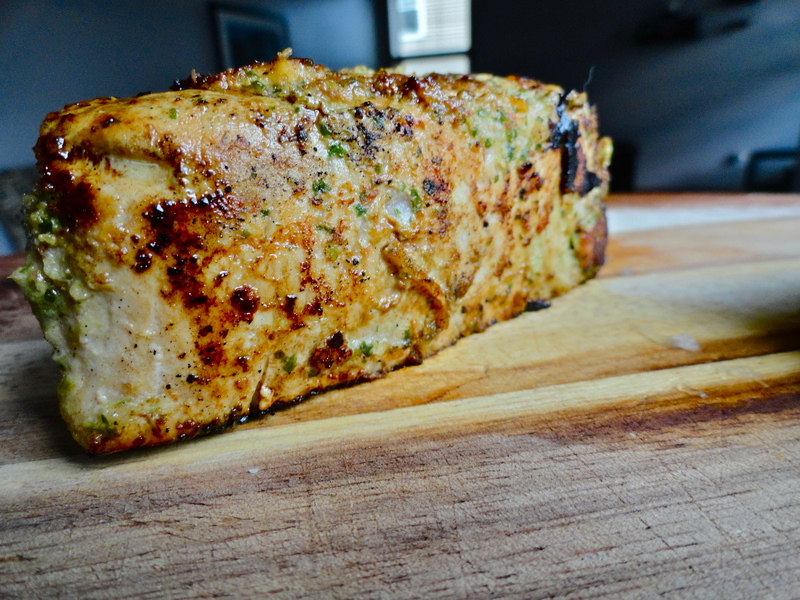 Season tuna steaks with salt and pepper then coat with pesto. Refrigerate for up to 30 minutes. 3. Heat 1 tbsp olive oil in a cast iron skillet over high heat. Reduce heat to medium-high and add tuna steaks. For rare tuna, cook for about 3 minutes on one side. Turn steak up on one end and cook for one minute more. Turn once more, so first seared side is facing up. Cook for 2 minutes. Finally, turn once more, cooking the edge that has not yet been seared. Remove from heat and let rest for at least to minutes. 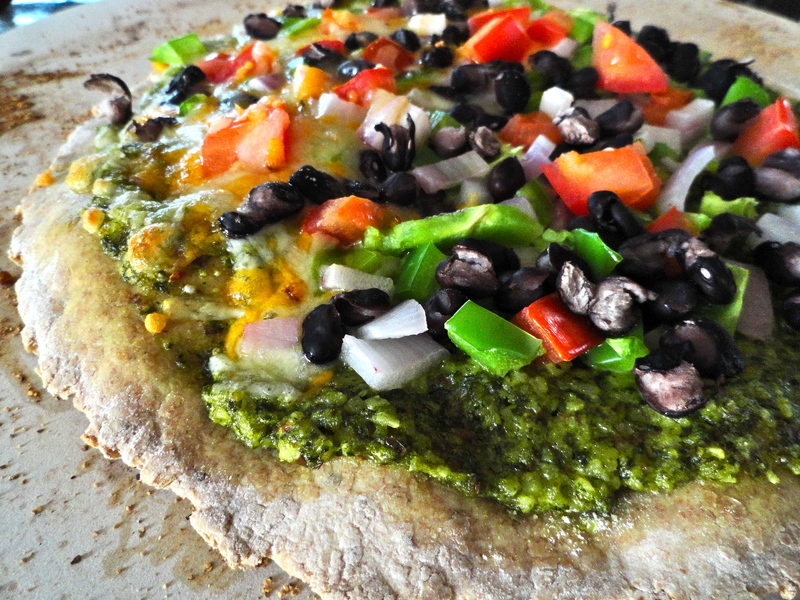 Slice thinly and dress with additional jalapeno cilantro pesto. (I served mine over a wasabi vinaigrette slaw and a little basmati rice). Do you ever need just a little of something, but don’t know what to do with the rest? It happens to me all the time with tomato paste. Recipes frequently call for 1-2 tbsp at a time, but not an entire can. I don’t want a bunch of open cans in my fridge, or the stress of trying to use it up before it goes bad. So, this is a wonderful alternative! Spoon it out into ice cube trays. 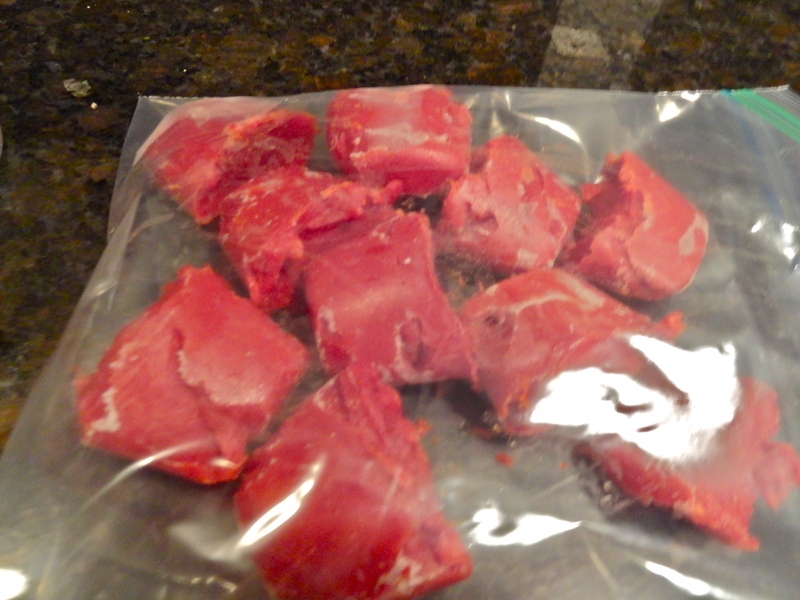 Once they are frozen, pop them out and place them in a zip top freezer bag. Viola! When you need just a little, you’re all set. Homemade Pesto: I made a huge batch last summer and froze it in ice cube trays. Chipotle in Adobo: Be sure to blend or chop the chipotle, otherwise you might not get some pepper in all the cubes. Coffee: Makes for great iced coffee. Also, I just read this great blog post from my friend, Ashley, who uses these cubes in after dinner drinks. My coffee-cube after dinner drink is an adapted version of her recipe. Genius! Leftover Herbs: Chop up, place in trays and fill with water to stock/broth. Add to soups, sauces and stir fries. Leftover Wine: But seriously, what is that? Stocks/Broths: Great to add to many dishes for extra flavor. Heavy Cream and Buttermilk: Great for that little leftover you couldn’t use up before it goes bad. You won’t be able to whip heavy cream once it’s been frozen, but you can still use it in sauces and baking. Fresh Berries: Freeze fresh berries with a bit of water to throw into drinks and smoothies. 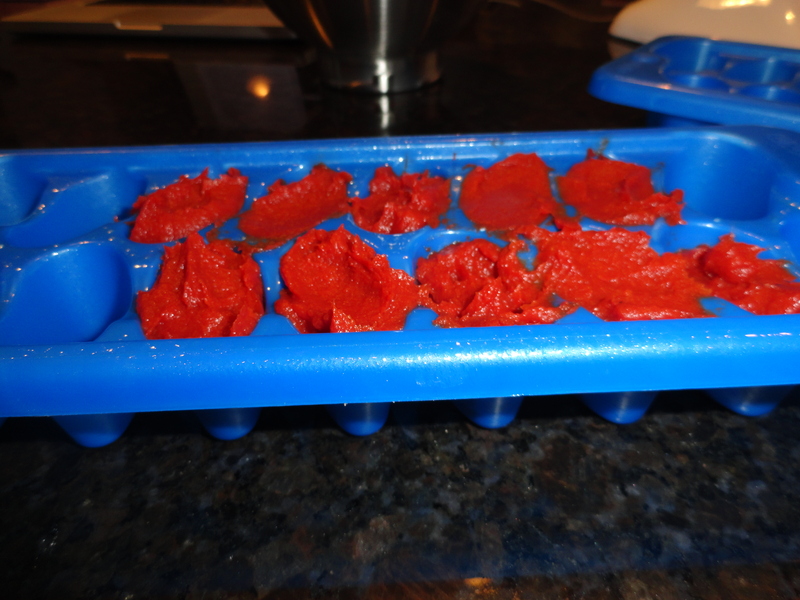 What do you like to use your ice cube trays for? I didn’t have a lot of time to make an appetizer for our latest drink tasting party (see French 75 for winning drink recipe :)), so I conjured up this quick and easy recipe with ingredients I already had in my fridge, minus the crescent rolls. There is an unlimited number of appetizers, snacks and desserts you can make using crescent rolls, and this is the first time I’ve purchased them in as long as I can remember. Finally General Mills figured out that we don’t always want seams in our Pillsbury Crescent rolls, so they have “seamless” sheets. I’m not sure how long they’ve had these (please reference my earlier statement regarding how long it’s been since I’ve made them) but I absolutely found it brilliant. I assembled and baked these little cuties before leaving for the party, and just reheated them in the oven before serving. We actually forgot about them and they got a little extra crispy, but they were still awesome and vanished quickly. They seemed to be quite a hit! 1. Preheat oven to 350 degrees. In a medium-sized bowl, combine cream cheese, pesto and sun-dried tomatoes. Incorporate chicken until all ingredients are well combined. 2. Roll out dough sheets. Using a pizza cutter, cut each piece twice across the length and three times across the width, making 12 small squares. Scoop 1-2 tbsp of chicken mixture in the center of each square. Carefully stretch the corners of each square up and around the mixture, matching all four corners on top. Pinch corners together tightly. This will probably leave four small holes, which is fine, or you can choose to press the seams together. 3. 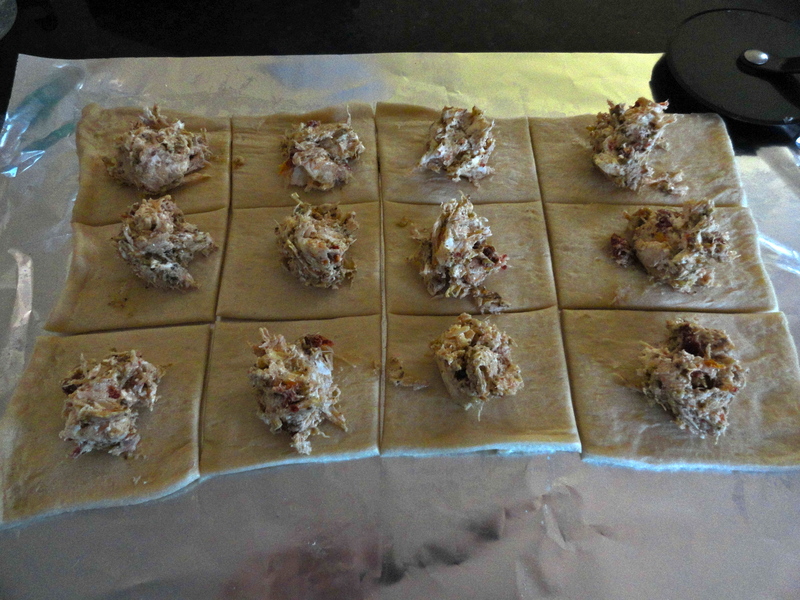 Place prepared pockets on a greased baking sheet. Be sure to leave space between them as they will expand a bit. Bake for 12-15 minutes, or until golden brown and puffy. Serve immediately. 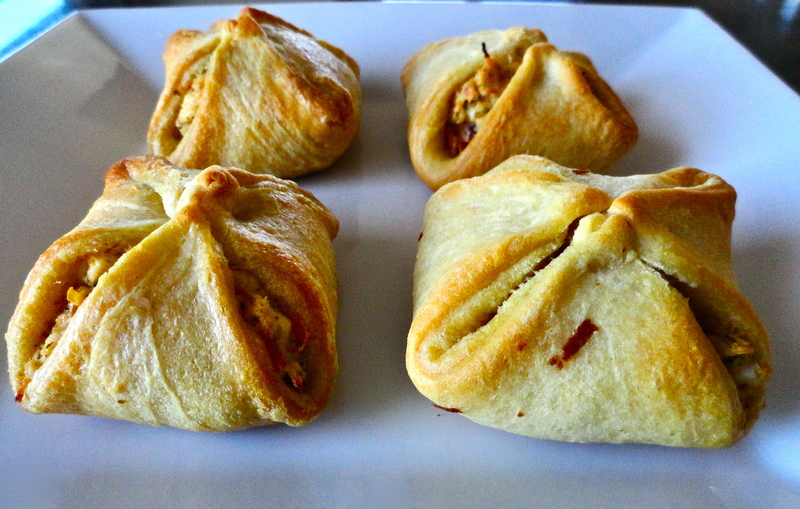 I made these along with turkey bacon pinwheels for a day at the beach. They were awesome. We had a handful left over after the beach, and they came out late night when everyone was starting to get hungry again. 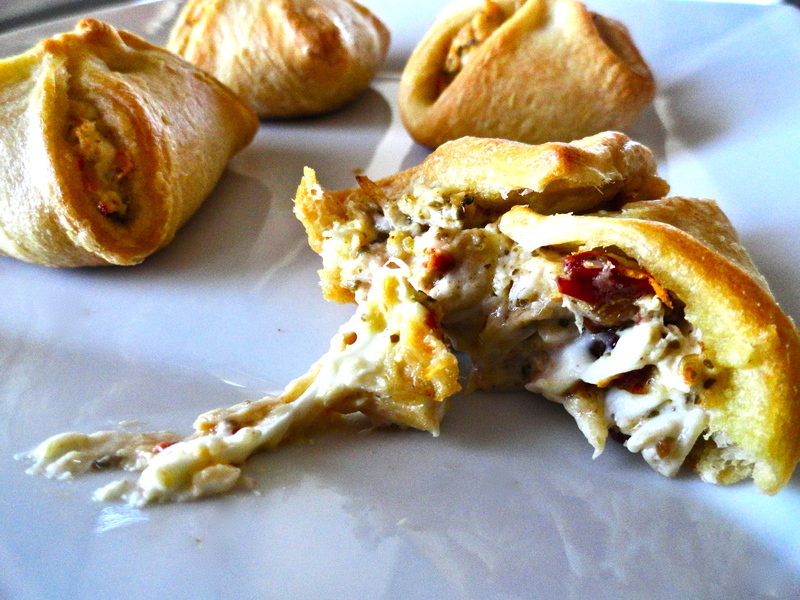 These are wonderful to have as appetizers since they are an excellent finger food. You could even just wrap them up and cut in half to take as a fresh, fun lunch. Anyway you roll it, this is a super excellent combination. 1. In a small skillet, heat 1 tsp of olive oil over medium heat. Reduce heat to low and add onions. Cook on low for 8-10 minutes, until onions are translucent and tender. 2. In a small bowl, combine mayonnaise and basil pesto. 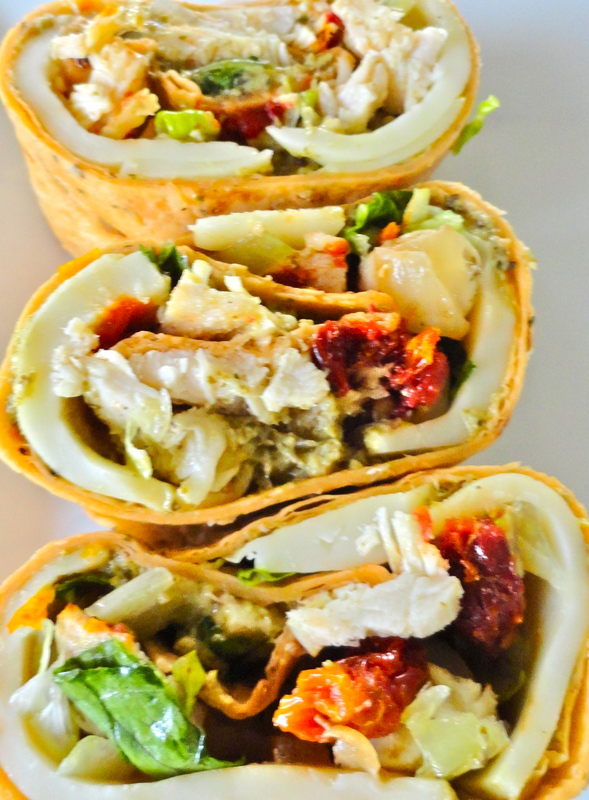 Spread mixture evenly on each wrap, leaving just 1/4-inch around the edges. 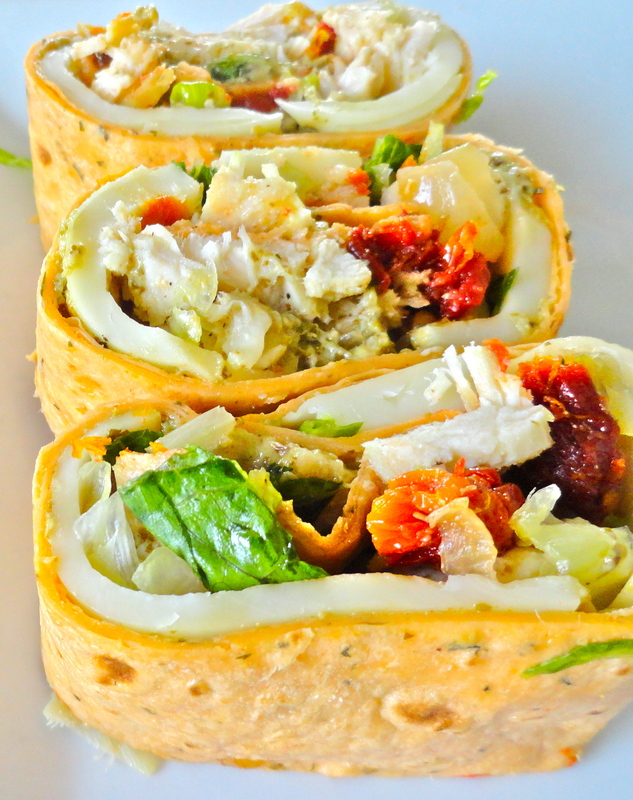 Add 4 slices of cheese to each wrap. Evenly layer the chicken, sun-dried tomatoes, lettuce and cooked onions. 3. Wrap tightly, being cautious not to tear it, and wrap in foil. Refrigerate for at least one hour before slicing. There is something about pesto and sun-dried tomatoes that goes so well together; it’s like chocolate and peanut butter, or peanut butter and jelly. Wait…does peanut butter go with everything? Okay, well probably not with pesto or sun-dried tomatoes. 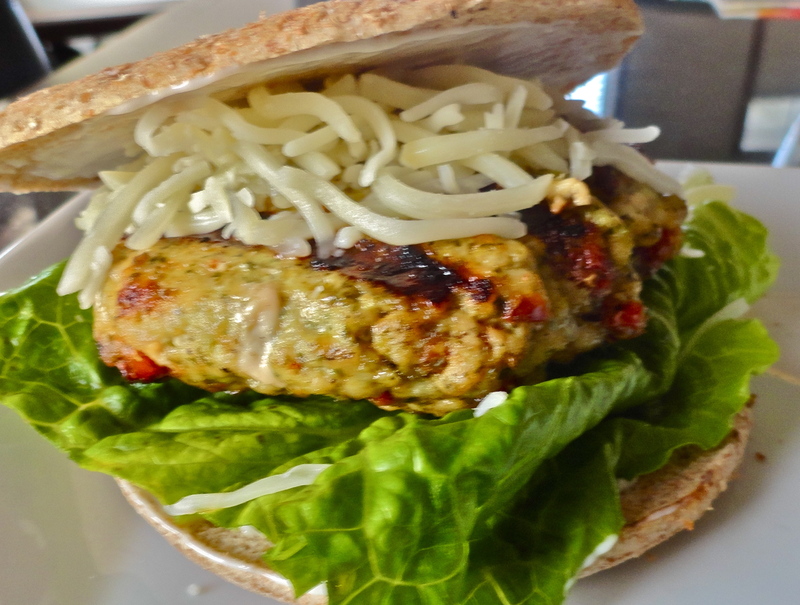 Anyway, I’ve made pesto turkey burgers in the past, and since I just made my very own basil pesto, I thought I’d give it whirl with my turkey burgers. I was a bit disappointed that I didn’t have fresh tomatoes to add to my burgers, but then I thought, well why don’t I give the sun-dried tomatoes a try. Good thing I did, because it was a match made in heaven and the burgers were super delish. I served these on sandwich thins with a little Miracle Whip and lettuce. Raw onions would have been a great addition, but I didn’t really think of it until my first bite of the burger. Nate’s burger (pictured below) was topped with a mozzarella-provalone mix. 1. Preheat grill (or skillet). In a large mixing bowl, combine turkey, olive oil, pesto, and tomatoes. Season with salt and pepper. Gentley mix together with hands and form into four patties. 2. Over medium-low heat, grill burgers for 8-10 minutes on each side, or until cooked through. Serve on buns with desired garnishments.